Zombeer is pretty much what the name implies: a game about zombies and beer. The protagonist awakes at a bar only to find that not only has he been bitten, but someone has run off with his girlfriend. That someone is Chancellor Colon Duty, the first of many references thrown at you without regard to rhyme or reason! Not all of them are a miss mind you, but for me many left me just scratching my head and going "Well, that happened." If you put something that looks like a Flux Capacitor on a wall without any context, its just a Y shaped light on the wall. I appreciate a good Back to the Future reference as much as the next nerd, but they are best done with tact. Of course if I wanted tact I don't suppose I'd be playing a game about beer and zombies. Some of which are questionably endowed. So there is that. Humor isn't a universal thing so it's hard to take off too much on that account. The game itself plays like a throwback to the FPS's of the 1990s. The controls are simple enough and about what you would expect for this type of game. Movement is bound to the WASD keys, aim with the mouse, click mouse 1 to fire and mouse 2 for precise aiming. The tutorials were decent although I found it baffling that they didn't mention that T turns on the flashlight. I think I played halfway through before I looked in the controls and found I was missing that. The game's main gimmick is that you have to drink Zombeer without over doing it to prevent yourself from turning into a zombie. As you play, a little meter moves at the bottom of the screen. Once it gets to the purple you'll become a zombie and can no longer fire weapons, but you'll avoid attacks from other zombies. If you don't drink a beer before it reaches the end, you lose. On the other hand, drink too many and you'll hit the green part of the bar which renders you drunk and unable to aim properly. If you drink more in this state you will also lose. At first I thought this mechanic might be annoying, but I found it to be one of the high points of the game. There are plenty of Zombeers in the levels so it shouldn't ever be a real problem. There are also Zombeer vending machines you can "hack" to get an unlimited supply. For the most part the game was pretty fluid, though there were a couple of times where it would randomly lag. Other than the occasional hiccup here or there the frame rate was pretty solid for me. I loved the art style once again reminding me of the early games of the era, and the sounds and music were just as great. The game has a really solid music track I must admit. The lighting effects were also impressive at times for what they were. There were parts, while not scary, had very nice atmosphere for the kind of game it is. The game has only a few weapons which I found to be slightly disappointing. You start off with a, uh, "Personal Massager" for a melee weapon. Shortly later you a nail gun, which then gets an upgrade. Then there's the shotgun, then a bit later you finally get the grenades. Part of the goal at one point is to collect pieces for a sniper rifle. This was exciting but anticlimactic as you only get to use it once in a shooting gallery type scenario as you are protecting a character from an on rush of zombies. There are also a few different collectibles to get. Magazines, Bobble-head figures, and developer commentary. These are actually hidden pretty decently for the most part, encouraging you to look around every corner and climb any suspicious looking areas. Speaking of zombies, there was also limited enemy types. You have basic zombies at first, followed by these mimes that scream at you. The mimes can actually pretty deadly if you don't take them out quick enough, even on easy a few seconds of them shouting will make you have a game over quickly. Then there are these zombies in suspenders which will start dancing. As they dance your beer meter will fill so you have to take them out before that happens. If your meter is low those guys aren't much of a threat at all. Later on near the end there are some cheerleader type zombies, but I couldn't discern exactly how they were different. They have an aura around them so my guess was they were the type of enemy that buffs others. While I did enjoy the game somewhat, it feels like a missed opportunity. I liked it enough that if they made a sequel I'd definitely give it a chance. There is one part where you need rubber boots to wade past electrified waters. You get the boots, pass the area, then its not a problem again in the game. That is how a lot of things in the game are. You need grenades to blow a door open. After that they are just regular grenades never used as a tool again. The game is also fairly short. I completed it in right around 3 hours. I feel if they had ran more with the exploration concept rather than just being a some what linear parody of gaming culture in general they could have had a gem on their hands. As it is, Zombeer stands as a decent zombie based FPS with a dash of hit or miss humor. 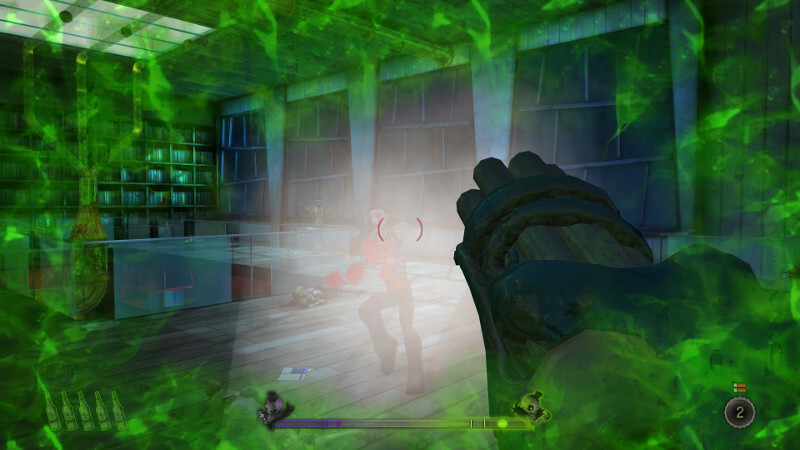 The problem with I, Zombie lies in its sparse content, repetitive gameplay, and dull environments.